"Joe Hughes, center, and mechanic 'Bucky' Bartlett, second from right, at Hughes Garage, which was built around 1910, before Armory Street existed. Hughes, reported to be the first person in Wakefield to own a car, also owned the Town's first garage and automobile agency. In 1909, he petitioned the Selectmen for a permit to establish a 42' x 75' garage at 503 Main Street because his repair shop on Center Street was 'wholly inadequate.' He also wanted to give the town 'an up-to-date garage.' He owned the garage until 1920 when it was purchased by David Barry. Barry's Garage was enlarged in 1922 with a new building erected on land south of the garage and to the rear, which necessitated the purchase and razing of the Abram Sweetser house. This enlargement occurred at the same time that Main Street was to be widened and a curve in the road straightened to accommodate the high school (present Galvin Middle School), and shortly after Armory Street was extended to Main Street. The new garage was built of tapestry brick, the same used in the high school and the armory (present Civic Center). It was built to hold 125 pleasure cars for storage, repair facilities and a raised showroom on Armory Street to display the latest models of the Buick line of automobiles. A 50' x 98' addition was added at a cost of $15,000 in 1925. A 'granolithic' sidewalk along Armory Street to the rear of the building was also constructed. Business for the Barrys increased and they built similar facilities in other towns, eventually getting out of the business in early February, 1932. The property was sold to Boston automobile dealer, J.W. Walker. The Barrys moved their business across the street at 510 Main Street two weeks later as Barry's Motor Parts." -- Text from calendar by Jayne M. D'Onofrio. Photo courtesy of Wakefield Daily Item. 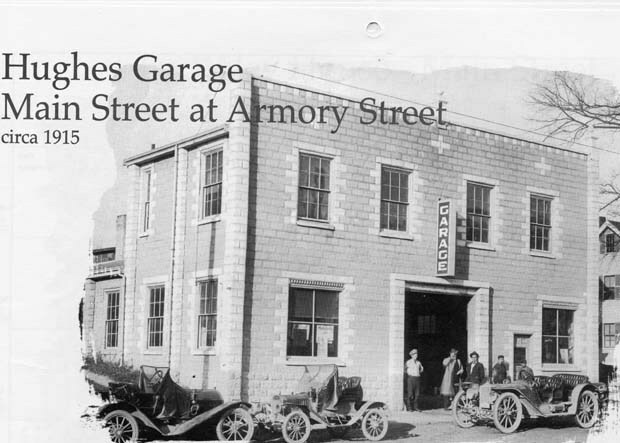 “Hughes Garage, Main Street at Armory Street, circa 1915,” NOBLE Digital Heritage, accessed April 22, 2019, https://digitalheritage.noblenet.org/noble/items/show/6987.